The SWR is adjusted with a small trimmer in the inside unit. The supplied RG-58 cable is 4m long (5m with model 15012), the included clips allow a clean installation inside the vehicle. 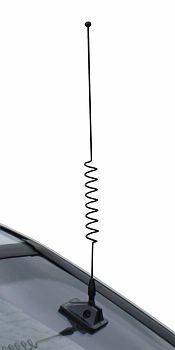 The maximum power is 50W with a properly aligned antenna. The radiator can be removed with a simple screwdriver, no need for special tools. The inclination of the radiator can be adjusted from 0 to 90°. The included cable has a PL connector. When using a real twin bander with built-in diplexer simultaneous duplex operation is possible. For example with the kenwood TM-D710E - use APRS on VHF and chat on UHF at the same time! The max. power is 50W per band. The radiator is 70cm long, the supplied cable is 5m long.